Contributing companies: STDI Consulting Inc.; Process Stream Technologies, Inc.; RHS Consulting Inc.
Strong security has always been part of the family of Lotus software products. More notably, it has been a feature that has made Lotus Notes and Domino an industry leader for security-rich messaging, calendar, and scheduling capabilities. with a robust platform for collaborative applications. With Lotus Notes and Domino 7, IBM extends the reach of Lotus Domino messaging and collaboration solutions while continuing to leverage your IT and application investments. The new version offers capabilities to support more people with fewer servers, to simplify administration, and to provide tighter integration with Web standards. 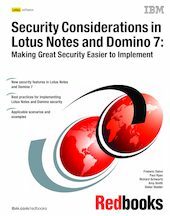 In this IBM Redbooks publication, we discuss specific security and anti-spam enhancements that have been incorporated into Notes and Domino 7.0. This publication is the fourth in a series about IBM Lotus security to be published. The previous IBM Redbooks about the topic are, in chronological order, "The Domino Defense: Security in Lotus Notes 4.5 and the Internet," SG24-4848, "Lotus Notes and Domino R5.0 Security Infrastructure Revealed," SG24-5341, and "Lotus Security Handbook," SG24-7017. The primary goal of these publications was to focus on the strong security that has always been part of the family of Lotus products. The present publication continues down the path set by these previous Redbooks, offering, as with each previous release, information about key features and functionalities pertaining to the security aspects of Lotus Notes and Domino Release 7.0.x, as well as best practices to implement these new features and functionalities.